Massachusetts man wanted after deadly car crash, arrested in Rhode Island. 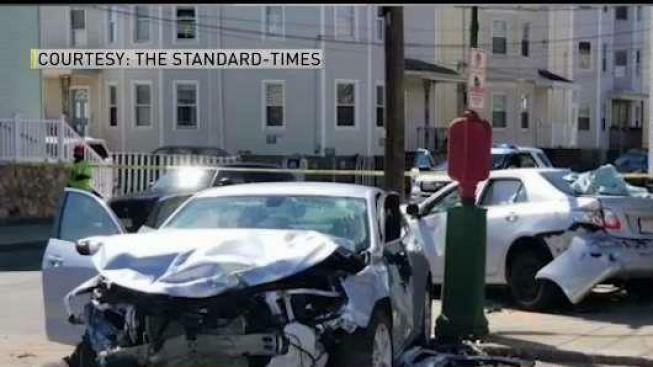 Massachusetts and Rhode Island law enforcement arrested a suspect who killed a 68-year-old female driver in New Bedford, Massachusetts. James Bennett-Werra, 21, fled the scene after his car crashed into another vehicle in New Bedford, Massachusetts on Wednesday. The crash killed Janet Murphy and caused serious injuries to a male passenger. Bennett-Werra fled the scene on foot, while a male passenger in his vehicle remained at the scene. Bennett-Werra is charged with manslaughter, motor vehicle homicide by reckless operation, assault with a dangerous weapon, leaving the scene of personal injury, leaving the scene - death resulting and reckless operation of a motor vehicle. Prior to the crash, Bennett-Werra was a fugitive for having cut off his court-ordered electronic monitoring device two days prior. He was previously convicted of assault and battery on a family or household member and carrying a deadly weapon. He was ordered to wear a monitoring bracelet after service time and parole. The Massachusetts Violent Fugitive Apprehension Section and local law enforcement in the area worked days before tracking Bennett-Werra in Pawtucket, Rhode Island. Police arrested the suspect without incident at around 5 p.m. on Saturday. Bennett-Werra was booked as a fugitive from justice by Pawtucket Police and will be held pending rendition to Massachusetts. Bennett-Werra had three outstanding warrants prior to his arrest on Saturday.